This article is about the band. For their debut album, see Kraftwerk (album). Kraftwerk (German: [ˈkʁaftvɛɐ̯k], lit. "power station") is a German band formed in Düsseldorf in 1970 by Ralf Hütter and Florian Schneider. Widely considered innovators and pioneers of electronic music, they were among the first successful acts to popularize the genre. The group began as part of West Germany's experimental krautrock scene in the early 1970s before fully embracing electronic instrumentation, including synthesizers, drum machines, vocoders, and home-made experimental musical instruments. On commercially successful albums such as Autobahn (1974), Trans-Europe Express (1977), and The Man-Machine (1978), Kraftwerk developed a self-described "robot pop" style that combined electronic music with pop melodies, sparse arrangements, and repetitive rhythms, while adopting a stylized image including matching suits. The band’s work would exert a lasting and profound influence across many genres of modern music, including synthpop, hip hop, post-punk, techno, ambient, and club music, and inspired a wide and diverse range of artists. Following the release of Electric Café (1986), member Wolfgang Flür left the group in 1987. Founding member Schneider departed in 2008. In 2014, the Recording Academy honored Kraftwerk with a Grammy Lifetime Achievement Award. Their latest album 3-D The Catalogue was released in 2017. As of 2019, the remaining members of the band continue to tour. Florian Schneider (flutes, synthesizers, violin) and Ralf Hütter (organ, synthesizers) met as students at the Robert Schumann Hochschule in Düsseldorf in the late 1960s, participating in the German experimental music and art scene of the time, which the Melody Maker jokingly dubbed "krautrock". [page needed] They joined a quintet known as Organisation, which released one album, Tone Float in 1969, issued on RCA Records in the UK, and split shortly thereafter. Schneider became interested in synthesizers deciding to acquire one in 1970. While visiting an exhibition in their hometown about visual artists Gilbert and George, they saw "two men wearing suits and ties, claiming to bring art into everyday life. The same year, Hütter and Schneider start bringing everyday life into art and form Kraftwerk". Early Kraftwerk line-ups from 1970 to 1974 fluctuated, as Hütter and Schneider worked with around a half-dozen other musicians during the preparations for and the recording of three albums and sporadic live appearances, most notably guitarist Michael Rother and drummer Klaus Dinger, who left to form Neu! [page needed] The only constant figure in these line-ups was Schneider, whose main instrument at the time was the flute; at times he also played the violin and guitar, all processed through a varied array of electronic devices. Hütter, who left the band for eight months, played synthesizer and keyboards (including Farfisa organ and electric piano). Their first three albums were free-form experimental rock without the pop hooks or the more disciplined song structure of later work. Kraftwerk, released in 1970, and Kraftwerk 2, released in 1972, were mostly exploratory musical improvisations played on a variety of traditional instruments including guitar, bass, drums, organ, flute, and violin. Post-production modifications to these recordings were used to distort the sound of the instruments, particularly audio-tape manipulation and multiple dubbings of one instrument on the same track. Both albums are purely instrumental. Live performances from 1972 to 1973 were made as a duo, using a simple beat-box-type electronic drum machine, with preset rhythms taken from an electric organ. These shows were mainly in Germany, with occasional shows in France. [page needed] Later in 1973, Wolfgang Flür joined the group for rehearsals, and the unit performed as a trio on the television show Aspekte for German television network ZDF. With Ralf und Florian, released in 1973, Kraftwerk began to move closer to its now classic sound, relying more heavily on synthesizers and drum machines. Although almost entirely instrumental, the album marks Kraftwerk's first use of the vocoder, which would in time become one of its musical signatures. According to English music journalist Simon Reynolds, Kraftwerk was influenced by what he called the "adrenalized insurgency" of Detroit artists of the late '60s MC5 and the Stooges. An excerpt from Autobahn's closing section. In 1976, Kraftwerk toured in support of the Radio-Activity album. David Bowie was among the fans of the record and invited the band to support him on his Station to Station tour, an offer the group declined. Despite some innovations in touring, Kraftwerk took a break from live performances after the Radio-Activity tour of 1976. After having finished the Radio-Activity tour Kraftwerk began recording Trans-Europe Express (German: Trans-Europa Express) at the Kling Klang Studio. [page needed] Trans-Europe Express was mixed at the Record Plant Studios in Los Angeles. It was around this time that Hütter and Schneider met David Bowie at the Kling Klang Studio. A collaboration was mentioned in an interview (Brian Eno) with Hütter, but it never materialised. The release of Trans-Europe Express in March 1977[page needed] was marked with an extravagant train journey used as a press conference by EMI France. The album won a disco award in New York later that year. In May 1981 Kraftwerk released Computer World (German: Computerwelt) on EMI records. [page needed] It was recorded at Kling Klang Studio between 1978 and 1981. [page needed] Much of this time was spent modifying the studio to make it portable so the band could take it on tour. [page needed] Some of the electronic vocals on Computer World were generated using a Texas Instruments language translator. "Computer Love" was released as a single backed with the Man-Machine track "The Model". [page needed] Radio DJs were more interested in the B-side so the single was repackaged by EMI and re-released with "The Model" as the A-side. The single reached number one in the UK, making "The Model" Kraftwerk's most successful song in that country. [page needed] As a result, the Man-Machine album also became a success in the UK, peaking at number 9 in the album chart in February 1982. The band's live set focused increasingly on song-based material, with greater use of vocals and the use of sequencing equipment for both percussion and music. In contrast to their cool and controlled image, the group used sequencers interactively, which allowed for live improvisation. Ironically Kraftwerk did not own a computer at the time of recording Computer World. 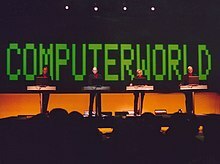 Kraftwerk returned to live performance with the Computer World tour of 1981, where the band effectively packed up its entire Kling Klang studio and took it along on the road. They also made greater use of live visuals including back-projected slides and films synchronized with the music as the technology developed, the use of hand-held miniaturized instruments during the set (for example, during "Pocket Calculator"), and, perhaps most famously, the use of replica mannequins of themselves to perform on stage during the song "The Robots". During the recording of "Tour de France", Ralf Hütter was involved in a serious cycling accident. [page needed] He suffered head injuries and remained in a coma for several days. During 1983 Wolfgang Flür was beginning to spend less time in the studio. Since the band began using sequencers his role as a drummer was becoming less frequent. He preferred to spend his time travelling with his girlfriend. Flür was also experiencing artistic difficulties with the band. After his final work on the 1986 album Electric Café (a.k.a. Techno Pop) he hardly returned to the Kling Klang Studio. In 1987 he left the band and was replaced by Fritz Hilpert. After years of withdrawal from live performance Kraftwerk began to tour Europe more frequently. In February 1990 the band played a few secret shows in Italy. Karl Bartos left the band shortly afterwards. The next proper tour was in 1991, for the album The Mix. Hütter and Schneider wished to continue the synth-pop quartet style of presentation, and recruited Fernando Abrantes as a replacement for Bartos. Abrantes left the band shortly after though. In late 1991, long-time Kling Klang Studio sound engineer Henning Schmitz was brought in to finish the remainder of the tour and to complete a new version of the quartet that remained active until 2008. In 1997 Kraftwerk made a famous appearance at the dance festival Tribal Gathering held in England. In 1998, the group toured the US and Japan for the first time since 1981, along with shows in Brazil and Argentina. Three new songs were performed during this period, which remain unreleased. Following this trek, the group decided to take another break. In July 1999 the single "Tour de France" was reissued in Europe by EMI after it had been out of print for several years. It was released for the first time on CD in addition to a repressing of the 12-inch vinyl single. Both versions feature slightly altered artwork that removed the faces of Flür and Bartos from the four-man cycling paceline depicted on the original cover. In 1999 ex-member Flür published his autobiography in Germany, Ich war ein Roboter. Later English-language editions of the book were titled Kraftwerk: I Was a Robot. The single "Expo 2000" was released in December 1999. The track was remixed and re-released as "Expo Remix" in November 2000. In August 2003 the band released Tour de France Soundtracks, its first album of new material since 1986's Electric Café. In January and February 2003, before the release of the album, the band started the extensive Minimum-Maximum world tour, using four customised Sony VAIO laptop computers, effectively leaving the entire Kling Klang studio at home in Germany. The group also obtained a new set of transparent video panels to replace its four large projection screens. This greatly streamlined the running of all of the group's sequencing, sound-generating, and visual-display software. From this point, the band's equipment increasingly reduced manual playing, replacing it with interactive control of sequencing equipment. Hütter retained the most manual performance, still playing musical lines by hand on a controller keyboard and singing live vocals and having a repeating ostinato. Schneider's live vocoding had been replaced by software-controlled speech-synthesis techniques. In November, the group made a surprising appearance at the MTV European Music Awards in Edinburgh, Scotland, performing "Aerodynamik". The same year a promotional box set entitled 12345678 (subtitled The Catalogue) was issued, with plans for a proper commercial release to follow. The box featured remastered editions of the group's eight core studio albums, from Autobahn to Tour de France Soundtracks. This long-awaited box-set would eventually be released in a different set of remasters in November 2009. In June 2005 the band's first-ever official live album, Minimum-Maximum, which was compiled from the shows during the band's tour of spring 2004, received extremely positive reviews. The album contained reworked tracks from existing studio albums. This included a track titled "Planet of Visions" that was a reworking of "Expo 2000". In support of this release, Kraftwerk made another quick sweep around the Balkans with dates in Serbia, Bulgaria, North Macedonia, Turkey, and Greece. In December, the Minimum-Maximum DVD was released. During 2006, the band performed at festivals in Norway, Ireland, the Czech Republic, Spain, Belgium, and Germany. In April 2008 the group played three shows in US cities Minneapolis, Milwaukee, and Denver, and were a coheadliner at the Coachella Valley Music and Arts Festival. This was their second appearance at the festival since 2004. Further shows were performed in Ireland, Poland, Ukraine, Australia, New Zealand, Hong Kong and Singapore later that year. The touring quartet consisted of Ralf Hütter, Henning Schmitz, Fritz Hilpert, and video technician Stefan Pfaffe, who became an official member in 2008. Original member Florian Schneider was absent from the lineup. Hütter stated that he was working on other projects. On 21 November, Kraftwerk officially confirmed Florian Schneider's departure from the band. The Independent commented on that incident: "There is something brilliantly Kraftwerkian about the news that Florian Schneider, a founder member of the German electronic pioneers, is leaving the band to pursue a solo career. Many successful bands break up after just a few years. It has apparently taken Schneider and his musical partner, Ralf Hütter, four decades to discover musical differences." Kraftwerk's headline set at Global Gathering in Melbourne, Australia, on 22 November was cancelled moments before it was scheduled to begin, due to a Fritz Hilpert heart problem. In 2009, Kraftwerk performed concerts with special 3D background graphics in Wolfsburg, Germany; Manchester, UK; and Randers, Denmark. Members of the audience were able to watch this multimedia part of the show with 3D glasses, which were given out. During the Manchester concert (part of the 2009 Manchester International Festival) four members of the GB cycling squad (Jason Kenny, Ed Clancy, Jamie Staff and Geraint Thomas) rode around the Velodrome while the band performed "Tour de France". The group also played several festival dates, the last being at the Bestival 2009 in September, on the Isle of Wight. Kraftwerk finally released The Catalogue box set on 16 November. It is a 12" album-sized box set containing all eight remastered CDs in cardboard slipcases, as well as LP-sized booklets of photographs and artwork for each individual album. Although not officially confirmed, Ralf Hütter suggested that a second boxed set of their first three experimental albums—Kraftwerk, Kraftwerk 2 and Ralf and Florian—could be on its way, possibly seeing commercial release after their next studio album: "We've just never really taken a look at those albums. They've always been available, but as really bad bootlegs. Now we have more artwork. Emil has researched extra contemporary drawings, graphics, and photographs to go with each album, collections of paintings that we worked with, and drawings that Florian and I did. We took a lot of Polaroids in those days." Kraftwerk also released an iOS app called Kraftwerk Kling Klang Machine. The Lenbach House in Munich exhibited some Kraftwerk 3-D pieces in Autumn 2011. Kraftwerk performed three concerts to open the exhibit. Kraftwerk played at Ultra Music Festival in Miami on 23 March 2012. Initiated by Klaus Biesenbach, the Museum of Modern Art of New York organized an exhibit titled Kraftwerk – Retrospective 1 2 3 4 5 6 7 8 where the band performed their studio discography from Autobahn to Tour de France over the course of eight days to sell-out crowds. The exhibit later toured to the Tate Gallery as well as to K21 in Düsseldorf. Kraftwerk performed at the No Nukes 2012 Festival in Tokyo, Japan. Kraftwerk were also going to play at the Ultra Music Festival in Warsaw, but the event was cancelled; instead, Kraftwerk performed at Way Out West in Gothenburg. A limited edition version of the Catalogue box set was released during the retrospective, restricted to 2000 sets. Each box was individually numbered and inverted the colour scheme of the standard box. In December, Kraftwerk stated on their website that they would be playing their Catalogue in Düsseldorf and at London's Tate Modern. Kraftwerk tickets were priced at £60 in London, but fans compared that to the $20 ticket price for tickets at New York's MoMA in 2012, which caused consternation. Even so, the demand for the tickets at The Tate was so high that it shut down the website. In March 2013, the band was not allowed to perform at a music festival in China due to unspecified "political reasons". In an interview in June after performing the eight albums of The Catalogue in Sydney, Ralf Hütter stated: "Now we have finished one to eight, now we can concentrate on number nine." In July, they performed at the 47th Montreux Jazz Festival. The band also played a 3-D concert on 12 July at Scotland's biggest festival – T in the Park – in Balado, Kinross, as well as 20 July at Latitude Festival in Suffolk, and 21 July at the Longitude Festival in Dublin. In October 2013 the band played four concerts, over two nights, in Eindhoven, Netherlands. The venue, Evoluon (the former technology museum of Philips Electronics, now a conference center) was handpicked by Ralf Hütter, for its retro-futuristic UFO-like architecture. Bespoke visuals of the building, with the saucer section descending from space, were displayed during the rendition of Spacelab. In 2014, Kraftwerk brought their four-night, 3D Catalogue tour to the Walt Disney Concert Hall in Los Angeles, and at NYC's United Palace Theatre. They also played at the Cirkus in Stockholm, Sweden and at the music festival Summer Sonic in Tokyo, Japan. In November 2014 the 3D Catalogue live set was played in Paris, France, at the brand new Fondation Louis-Vuitton from 6 to 14 November. and then in the iconic Paradiso concert hall in Amsterdam, Netherlands, where they played before in 1976. In 2015, Ralf Hütter, being told that the Tour de France would be starting that year in the nearby Dutch city of Utrecht, decided that Kraftwerk would perform during the "Grand Depart". Eventually the band played three concerts 3 and 4 July in TivoliVredenburg performing "Tour de France Soundtracks" and visited the start of the Tour in-between. In April 2017, Kraftwerk announced 3-D The Catalogue, a live album and video documenting performances of all eight albums in The Catalogue that was released 26 May 2017. It is available in multiple formats, the most extensive of which being a 4-disc Blu-ray set with a 236-page hardback book. This release was awarded with a Grammy Award for Best Dance/Electronic Album at the ceremony that took place on January 28, 2018. Kraftwerk have been recognized as pioneers of electronic music as well as subgenres such as electropop, art pop, and synth-pop. In its early incarnation, the band pursued an avant-garde, experimental rock style inspired by the compositions of Karlheinz Stockhausen. Hütter has also listed the Beach Boys as a major influence. The group was also inspired by the funk music of James Brown and, later, punk rock. They were initially connected to the German krautrock scene. In the mid-1970s, they transitioned to an electronic sound which they described as "robot pop". Kraftwerk's lyrics dealt with post-war European urban life and technology—traveling by car on the Autobahn, traveling by train, using home computers, and the like. They were influenced by the modernist Bauhaus aesthetic, seeing art as inseparable from everyday function. Usually, the lyrics are very minimal but reveal both an innocent celebration of, and a knowing caution about, the modern world, as well as playing an integral role in the rhythmic structure of the songs. Many of Kraftwerk's songs express the paradoxical nature of modern urban life: a strong sense of alienation existing side-by-side with a celebration of the joys of modern technology. All of Kraftwerk's albums from Trans Europe Express onwards have been released in separate versions: one with German vocals for sale in Germany, Switzerland and Austria and one with English vocals for the rest of the world, with occasional variations in other languages when conceptually appropriate. Live performance has always played an important part in Kraftwerk's activities. Also, despite its live shows generally being based around formal songs and compositions, live improvisation often plays a noticeable role in its performances. This trait can be traced back to the group's roots in the first experimental Krautrock scene of the late 1960s, but, significantly, it has continued to be a part of its playing even as it makes ever greater use of digital and computer-controlled sequencing in its performances. Some of the band's familiar compositions have been observed to have developed from live improvisations at its concerts or sound-checks. Throughout their career, Kraftwerk have pushed the limits of music technology with some notable innovations, such as home-made instruments and custom-built devices. The group has always perceived their Kling Klang Studio as a complex music instrument, as well as a sound laboratory; Florian Schneider in particular developed a fascination with music technology, with the result that the technical aspects of sound generation and recording gradually became his main fields of activity within the band. [page needed] Alexei Monroe called Kraftwerk the "first successful artists to incorporate representations of industrial sounds into non-academic electronic music". On the Radio-Activity tour in 1976 Kraftwerk tested out an experimental light-beam-activated drum cage allowing Flür to trigger electronic percussion through arm and hand movements. Unfortunately, the device did not work as planned, and it was quickly abandoned. The same year Ralf Hütter and Florian Schneider commissioned Bonn-based "Synthesizerstudio Bonn, Matten & Wiechers" to design and build the Synthanorma Sequenzer with Intervallomat, a 4×8 / 2×16 / 1×32 step-sequencer system with some features that commercial products couldn't provide at that time. The music sequencer was used by the band for the first time to control the electronic sources creating the rhythmic sound of the album Trans-Europe Express. The band is notoriously reclusive, providing rare and enigmatic interviews, using life-size mannequins and robots to conduct official photo shoots, refusing to accept mail and not allowing visitors at the Kling Klang Studio, the precise location of which they used to keep secret. Another notable example of this eccentric behavior was reported to Johnny Marr of the Smiths by Karl Bartos, who explained that anyone trying to contact the band for collaboration would be told the studio telephone did not have a ringer, since while recording, the band did not like to hear any kind of noise pollution. Instead, callers were instructed to phone the studio precisely at a certain time, whereupon the phone would be answered by Ralf Hütter, despite never hearing the phone ring. Chris Martin of Coldplay recalled in a 2007 article in Q magazine the process of requesting permission to use the melody from the track "Computer Love" on "Talk" from the album X&Y. He sent a letter through the lawyers of the respective parties and several weeks later received an envelope containing a handwritten reply that simply said "yes". According to music journalist Neil McCormick, Kraftwerk might be "the most influential group in pop history". NME wrote: "'The Beatles and Kraftwerk' may not have the ring of 'the Beatles and the Stones', but nonetheless, these are the two most important bands in music history". AllMusic wrote that their music "resonates in virtually every new development to impact the contemporary pop scene of the late 20th century". Kraftwerk's musical style and image can be heard and seen in 1980s synthpop groups such as Gary Numan, Ultravox, John Foxx, Orchestral Manoeuvres in the Dark, Human League, Depeche Mode, Visage, and Soft Cell. Kraftwerk would also go on to influence other forms of music such as hip hop, house, and drum and bass, and they are also regarded as pioneers of the electro genre. Most notably, "Trans Europe Express" and "Numbers" were interpolated into "Planet Rock" by Afrika Bambaataa & the Soul Sonic Force, one of the earliest hip-hop/electro hits. Kraftwerk helped ignite the New York electro-movement. Techno was created by three musicians from Detroit, often referred to as the 'Belleville three' (Juan Atkins, Kevin Saunderson & Derrick May), who fused the repetitive melodies of Kraftwerk with funk rhythms. The Belleville three were heavily influenced by Kraftwerk and their sounds because Kraftwerk's sounds appealed to the middle-class blacks residing in Detroit at this time. Depeche Mode's composer Martin Gore emphasized: "For anyone of our generation involved in electronic music, Kraftwerk were the godfathers". Vince Clarke of Erasure, Yazoo and Depeche Mode, is also a notable disco and Kraftwerk fan. Daniel Miller, founder of Mute Records, purchased the vocoder used by Kraftwerk in their early albums, comparing it to owning "the guitar Jimi Hendrix used on 'Purple Haze'". Andy McCluskey and Paul Humphreys, founding members of OMD, have stated that Kraftwerk was a major reference on their early work, and covered "Neon Lights" on the 1991 album, Sugar Tax. The electronic band Ladytron were inspired by Kraftwerk's song "The Model" when they composed their debut single "He Took Her To a Movie". Richard D James a.k.a. Aphex Twin, has noted Kraftwerk as one of his biggest influences and called Computer World as a very influential album towards his music and sound. Björk has cited the band as one of her main musical influences. Electronic musician Kompressor has cited Kraftwerk as an influence. The band was also mentioned in the song "Rappers We Crush" by Kompressor and MC Frontalot ("I hurry away, get in my Chrysler. Oh, the dismay!/Someone's replaced all of my Backstreet Boys with Kraftwerk tapes!"). Dr. Alex Paterson of the Orb listed The Man-Machine as one of his 13 most favourite albums of all time. According to NME, Kraftwerk’s pioneering "robot pop" also spawned groups like Prodigy, and Daft Punk. Kraftwerk inspired many acts from other styles and genres. David Bowie's "V-2 Schneider", from the 1977's Heroes album, was a tribute to Florian Schneider. Post-punk bands Joy Division and New Order were heavily influenced by the band. Joy Division frontman Ian Curtis was a fan, and showed his colleagues records that would influence their music. New Order also would sample "Uranium" in its biggest hit "Blue Monday". Siouxsie and the Banshees recorded a cover of "Hall of Mirrors" on their 1987 album Through the Looking Glass which was lauded by Ralf Hütter: "In general, we consider cover versions as an appreciation of our work. The version of "Hall of Mirrors" by Siouxsie and the Banshees is extraordinary, just like the arrangements of Alexander Bălănescu for his Bălănescu Quartet release [of Possessed, 1992]. We also like the album El Baile Alemán of Señor Coconut a lot." Members of Blondie have admitted on several occasions that Kraftwerk were an important reference for their sound by the time they were working on their third album Parallel Lines. The worldwide hit "Heart of Glass" turned radically from an initial reggae-flavoured style to its distinctive electronic sound in order to imitate the technological approach of Kraftwerk's albums and adapt it to a disco concept. U2 recorded a cover version of "Neon Lights" as did Simple Minds. An LCD Soundsystem song called "Get Innocuous!" is built on a bass line reminiscent of Kraftwerk single "The Robots". 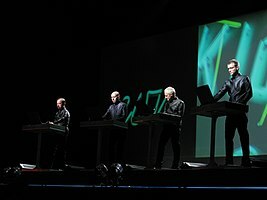 The band also performed some Kraftwerk songs as snippets during live shows. Franz Ferdinand were inspired by Kraftwerk's song "The Model" when writing their song "Walk Away". Rammstein also covered their song, Das Modell releasing it on a non-album single in 1997. John Frusciante cited the ability to experiment of the group as an inspiration when working in a recording studio. In January 2018 BBC Radio 4 broadcast the 30-minute documentary Kraftwerk: Computer Love which examined "how Kraftwerk's classic album Computer World has changed people's lives." ^ a b c Stubbs, David. "Ladies und Gentlemen, the future has arrived". The Independent. Retrieved 24 October 2016. ^ a b c d e Lusher, Adam. "The Kraftwerk conference: Why a bunch of academics consider the German electropoppers worthy of their own symposium". The Independent. Retrieved 11 September 2016. ^ a b Michaels, Sean. "Kraftwerk announce residency at New York's Moma". The Guardian. Retrieved 12 February 2018. ^ a b c d e f McCormick, Neil. (30 January 2013). "Kraftwerk: the most influential group in pop history?". The Telegraph. Retrieved 10 August 2013. ^ a b c d Ankeny, Jason. Artist Biography by Jason Ankeny at AllMusic. Retrieved 11 September 2012. ^ "CONCERTS". www.kraftwerk.com. Retrieved 29 January 2018. ^ a b c d e f g h i j k l m n o p q r s t Bussy, Pascal (1993). Kraftwerk—Man, Machine & Music. SAF Publishing. ISBN 978-0-946719-70-9. ^ a b Rogers, Jude (27 January 2013). "Why Kraftwerk are still the world's most influential band". The Observer. Retrieved 27 January 2013. ^ a b Flür, Wolfgang (1993). "Kraftwerk": I Was A Robot. Sanctuary Publishing. ISBN 978-1-86074-417-4. ^ a b c Simon, Reynolds (1999). Generation Ecstasy: into the world of techno and rave culture. Routledge. ^ "allmusic ((( Kraftwerk > Charts & Awards > Billboard Albums )))". www.allmusic.com. Retrieved 9 July 2009. ^ "Datamath". Datamath. 5 December 2001. Retrieved 24 August 2014. ^ "Kraftwerk albums Chart". www.officialcharts.com. Retrieved 8 August 2013. ^ 2 Cents: Kraftwerk, Tribal Gathering (25 May 1997). ^ Reid, Graham (27 September 2008). "Interview: Ralf Hutter of Kraftwerk". The New Zealand Herald. Retrieved 27 September 2008. ^ Music. "Kraftwerk's co-founder Florian Schneider leaves band". Telegraph.co.uk. Retrieved 7 December 2012. ^ "MIF.co.uk". MIF.co.uk. Retrieved 7 December 2012. ^ Simpson, Dave (3 July 2009). "Kraftwerk/Steve Reich". The Guardian. London. Retrieved 7 May 2010. ^ "More and more remastered Kraftwerk eight-CD promo boxed sets auctioned via eBay". Side-line.com. 1 December 2012. Retrieved 7 December 2012. ^ Witter, Simon (Spring 2006). "article". Dummy. ^ "Lenbachhaus – Kunstbau". Lenbachhaus.de. Archived from the original on 26 April 2012. Retrieved 14 December 2012. ^ McGreevy, Ronan (2018-06-19). "Sun cream at the ready as Longtitude festival gets underway in Marlay Park". Irish Times. ^ Reageren Uw reactie Naam E-mail adres Versturen. "Kraftwerk: 'Optreden in Evoluon is geweldig'". Ed.nl. Retrieved 24 August 2014. ^ saret97. "Kraftwerk - Spacelab (Live @ Evoluon 18-10-2013)". YouTube. Retrieved 24 August 2014. ^ "Kraftwerk – KRAFTWERK 1 2 3 4 5 6 7 8 – LAPhil". Kraftwerk.laphil.com. 24 September 2012. Archived from the original on 9 February 2014. Retrieved 11 February 2014. ^ "Summer Sonic 2014 Lineup". Summersonic.com. 19 May 2014. Retrieved 24 August 2014. ^ "Computer World (3-D Le Catalogue): Kraftwerk – Fondation Louis Vuiton, Paris – November 10, 2014". My Concert Archive. ^ "Kraftwerk sets 8-night Paradiso residency – NL Times". NL Times. ^ John Shepherd (8 July 2003). Continuum Encyclopedia of Popular Music of the World: VolumeII: Performance and Production. A&C Black. p. 268. ISBN 978-0-8264-6322-7. ^ Giles, Jeff. "Beatles to Receive Grammy Lifetime Achievement Award". Ultimate Classic Rock. Retrieved 28 October 2016. ^ Ratliff, Ben. "Made in Detroit, Different Music Models". The New York Times. Retrieved 28 October 2016. ^ Staff. "Kraftwerk brought their 3D tour to United Palace Theatre (pics, set list), do it again tonight". Brooklyn Vegan. Retrieved 24 October 2016. ^ Raihala, Ross. "Review: Kraftwerk rocks Northrop Auditorium, German-style". Twin Cities. Retrieved 24 October 2016. ^ Coplan, Chris. "Video Surfaces of Kraftwerk's Television Debut in 1970". Consequence of Sound. Retrieved 31 March 2016. ^ Segal, Dave. "What Does Kraftwerk Mean to You?". The Stranger. Retrieved 11 September 2016. ^ "D>Elektro – MATERIAL – Kraftwerk – Interview 11/76 – P. Alessandrini". Thing.de. Retrieved 14 December 2012. ^ Steven D. Martinson; Renate A. Schulz (2008). Deutsch Als Fremdsprache. Peter Lang. p. 225. ISBN 978-3-03911-627-0. ^ Barr, Tim (1998). Kraftwerk: from Dusseldorf to the Future With Love. Ebury Press. ISBN 978-0091864903. ^ Monroe, Alexei (2005). Interrogation Machine: Laibach and NSK. Cambridge: The MIT Press. p. 212. ISBN 0-262-63315-9. ^ "Kraftwerk Vocoder (Barth / Leunig) sold: $12,500". Sequencer.de. Retrieved 14 December 2012. ^ a b c "Aktivitaet Online – Archive – General articles – Kling Klang: The Electronic Garden". Aktivitaet-fanzine.com. Retrieved 14 December 2012. ^ ""Tomorrow's world" (1976 Tv performance)". YouTube. 23 January 2008. Retrieved 14 December 2012. ^ Flür, Wolfgang (2001). "Kraftwerk": I Was A Robot. Sanctuary Publishing. ISBN 978-1-86074-417-4. ^ Reynolds, Simon. "Generation Ecstasy". Routledge. 2013. ^ "Synthanorma Sequenzer – description by D. Matten" (PDF). Elektropolis.de. Retrieved 14 December 2012. ^ "Top 100 Albums: Kraftwerk Trans-Europe-Express commented by Johnny Marr and Mark Radcliffe". YouTube. 1 April 2007. Retrieved 14 December 2012. ^ Harrington, Richard (27 May 2005). "These Days, Kraftwerk is Packing Light". Washington post. p. WE08. Retrieved 6 July 2006. ^ Fink, R. "The story of ORCH5, or, the classical ghost in the hip-hop machine". Popular Music 24.3 (2005): 339–356. 9 November 2009. ^ "KEXP 90.3 FM – KEXP Documentary: POP Goes Electronic". Archived from the original on 1 March 2009. Retrieved 7 May 2009. ^ "Synth Britannia", BBC Four, 19 October 2009. Excerpt. ^ "OMD biography". OMD.uk.com. Archived from the original on 20 February 2012. Retrieved 7 December 2012. ^ "OMD discography". OMD.uk.com. Archived from the original on 14 December 2013. Retrieved 7 December 2012. ^ Lester, Paul (5 October 2001). "Tank boy". The Guardian. London. Archived from the original on 29 May 2010. Retrieved 25 April 2010. ^ Pytlik, Mark (2003). Björk: Wow and Flutter. ECW Press. p. 126. ISBN 1-55022-556-1. ^ "Bakers Dozen: Alex Paterson Of The Orb Chooses His Favourite 13 Albums". Thequietus.com. 4 November 2010. Retrieved 7 December 2012. ^ Roy Carr & Charles Shaar Murray (1981). Bowie: An Illustrated Record: p. 92. ^ The album Trans-Europe Express was played over the PA before Joy Division's concerts. New Order's song "Your Silent Face" also has some similarities with "Europe Endless" and had a working title of "KW1", or "Kraftwerk 1". New Order also recorded a song called "Krafty" that appeared as a single and on the album Waiting for the Sirens' Call. ^ "Intervista: I Kraftwerk, redeirelettronica: «Partiamo per il Tour de France»", La Stampa (numero 229), p. 29, 22 August 2003, In genere lo consideriamo un apprezzamento per il nostro lavoro. La versione di Siouxsie di "Hall Of Mirrors" è straordinaria, come gli arrangiamenti di Alexander Balanescu per quartetto d'archi. Anche il disco di Señor Coconut ci è piaciuto molto. ^ U2 included "Neon Lights" as the B-side of their 2004 single "Vertigo". Simple minds included theirs on an all-cover tunes album by same name. ^ Schuh, Michael (1 March 2004). ""Kraftwerk hatten noch Mut zum Risiko ..."". laut.de. Retrieved 14 November 2017. ^ "Kraftwerk: Computer Love, Soul Music - BBC Radio 4". BBC. Retrieved 29 January 2018. ^ a b c "Kraftwerk – About _ Facebook". KraftwerkOfficial. 2012. Retrieved 28 April 2017. ^ "Kraftwerk: Über Leverkusen in den Musik-Olymp". ^ "KARL BARTOS – Curriculum vitae Karl Bartos". Karl Bartos. 2016. Retrieved 30 March 2017. Wikimedia Commons has media related to Kraftwerk.